It is common marketing advice to make signups as simple as possible. You don’t want to scare people off by asking for a lot of information. So, when we launched our SEO and webmaster tool Monsido, we made our signup pages incredibly simple. No menus, no footer, no distractions. Just one text field and a button, with the copy explaining why the visitor should complete the form at the top. We didn’t ask for “irrelevant” information such as full name, company name and email. We only asked for the information which we couldn’t continue without: the address of the website. We also thought our button was great in its simplicity. It wasn’t just a strong call to action. The button text was all about what the visitor would get. And who doesn’t like to get free stuff? When we launched we got a fair amount of traffic. Our simplistic approach worked – at least in the sense that a lot of people submitted their domain and clicked the big red button. Once they did that, they were taken to a new screen where they could see their scan was in progress or completed. To get the results of the scan, all they had to do was put in some basic info. They could even fill out the info while waiting for the scan to complete! We were operating under the belief that, once people saw that their website scan was complete, they’d be even more eager to fill out their info. We were shocked by how wrong we were. Instead of getting lots of signups, more than 90% of every submitted domain was abandoned. The users never bothered to put in their info, which means they never even got to see the results of their scan! At first, we thought that this was to be expected. But, after a while, it dawned on us that an 90% abandonment rate was NOT okay (or at least something we were willing to live with). The visitors were clearly interested in a free website review. Why else would they submit their domain? We also knew from the users who actually did fill in their information and got their results that we provided a great value and a very nice and simple user interface. Every user was happy about the product. It was free. It was easy. What was so difficult about filling in their name and email so they could get the results of the scan!?! 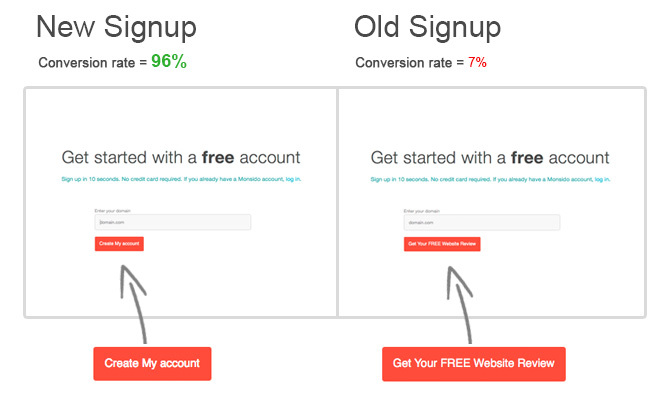 We did numerous A/B testing of the signup page copy. We tried to better communicate all the information people would be getting and how simple the product would be to use. But nothing changed the abandonment rate. It didn’t dawn on us to test the button text (it was perfect, right?). Then we stumbled upon another online service with had the same signup approach as us. They had pretty much the same message on their page. Like us, all you had to do was fill in a domain. It was so simple, how could we not fill in monsido.com. Instead of being taken to a signup page to claim our result, we got our results immediately. That’s when we finally got it. The people who were submitting their domains to use were not expecting to give out any other info. They wanted their free website review (as the button promised) immediately. Instead of a report, they were asked to create an account. We were asking them to commit to something when they wanted was to see what we could tell them about their site. But that’s not how Monsido works. And that's not what we were giving them. 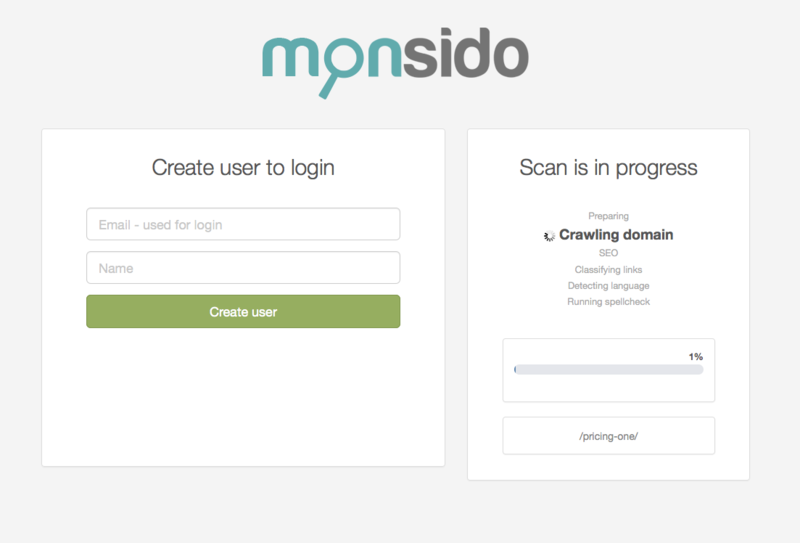 Monsido is a tool that scans websites regularly – it’s not just a one-off scan. To make use of the tool, you’ve really got to create an account so you can log into the dashboard and get continuous insight about SEO errors, broken links, downtime, and more. We had tried communicating this in various ways in the A/B testing of the copy. But it didn’t dawn on us to change the text on the button. Why would we? The CTA “Get Your FREE Website Review” just seemed too perfect. The CTA actually was perfect -- hence the large number of domains which got submitted. It just wasn’t perfect for what we were offering. In hindsight, the solution was quite obvious. We changed the button text to this: "Create My Account"
Our abandonment rate plummeted to 4%. It doesn’t matter how perfectly simple and enticing your pages are. 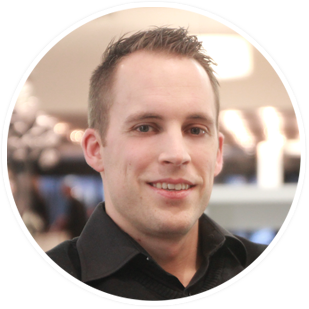 They must accurately reflect what you are offering if you want to optimize conversion rates. Micro-optimization can have a HUGE impact on your conversion rates. Don't be satisfied with dismal conversions. Don't even be satisfied with okay conversions! Test micro changes and get your conversion rates where they should be.